I upgraded the 950 sound processor to a 990. 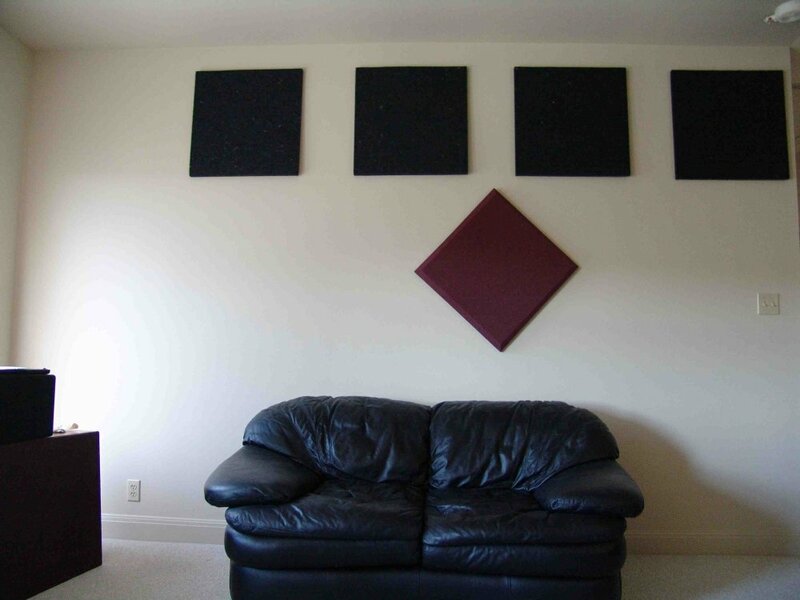 I decided to add some Auralex sound absorbing material to both the home theater & music rooms. I used some foam and some like materials. Some photos of the walls for the music rooms are here here, and here. I definitely like the deadening the material has added to the rooms. 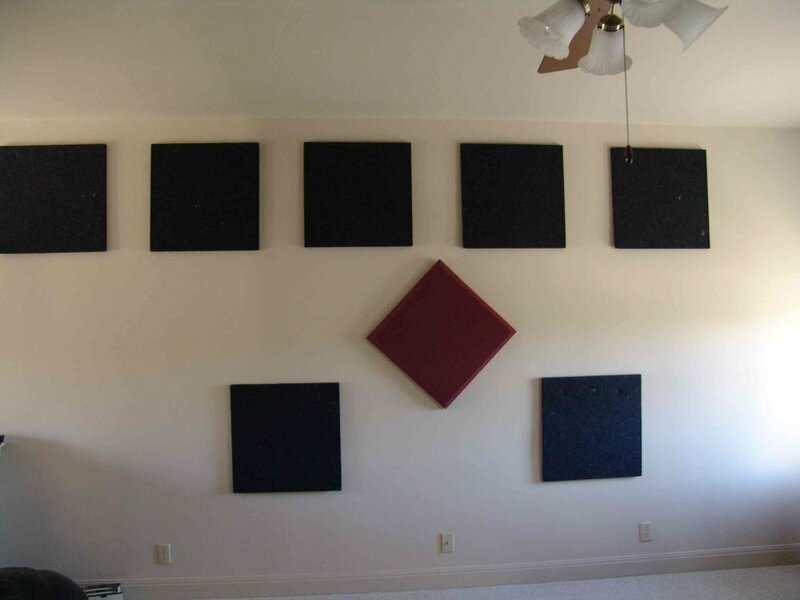 While you can equalize to reduce the midrange, reducing echo is better sounding to my ears. Each room was about 250 to do. The material is nailed to the walls with finishing nails in the case of the felt material. The foam has a string glued to it & is hung to a tack. These panels are large but very light. Complete redo of the front. The EFE's have moved to the back. The new front setup is described here. Ed contacted me after I noticed the continued dip and sent me a new choke to replace in the crossovers. I think that was the problem. The dip is gone (at least as best as I can tell). I'll post an update after I've had a chance to do some serious listening with the fix. The new curves comparing the B&W to the EFE's can be found HERE and HERE. The measuring technique was the same. Note the mic is about 1 meter from the speaker and the speaker is about 30" off the floor as before. After talking with Ed about the perceived midrange dip, he sent me some resistors to substitute. I installed them and yes the high endgot more detail. I decided to put some old DSP course work I had done to use. I wrote up an FFT algorithm, generated a white noise CD from random data, and hooked up a D1000E AKG mic to my Ultra 10 thru a peavey mic mixer. All this to try to generate a freq response for the B&W vs the EFE. The mic was about 1 meter from the speakers (not in an anechoic room though) and the SPL level at the mic was about 80db "C" weighted slow response. For these tests, the speakers were driven directly. IE, CD player drives preamp, preamp drives amp, amp drives speakers. The Behringer was bypassed for the white noise FFT test. The response curves can be seen HERE. Note the mic is not a reference mic, so I don't expect it to be flat above 10K. Also, the room definitely is not flat below 500Hz. I also built some data with constant tones at various frequencies and walking around the room I could easily hear dramatic differences in volume due to standing waves. The plot shows the EFE T-22 in green and the B&W HTM2 in red.From the plot, I still see a dip in the T-22 around 3K relative to the B&W. The lower frequencies track pretty closely, while at the top end the T-22 is flatter. Above 10K, the EFE had more output, but because the mic is a big unknown, I'm not sure which is the more accurate. Response is down more than 15db in both cases, which I don't believe is correct. The white noise input FFT is essentially flat to 20K, so it is not the input that is down. I think the high frequency attenation is due to the mic. I guess I need to pick up a better mic for future testing. In any case, I did prefer the sound of the T-22 with the smaller resistor. It is slightly brighter sounding. 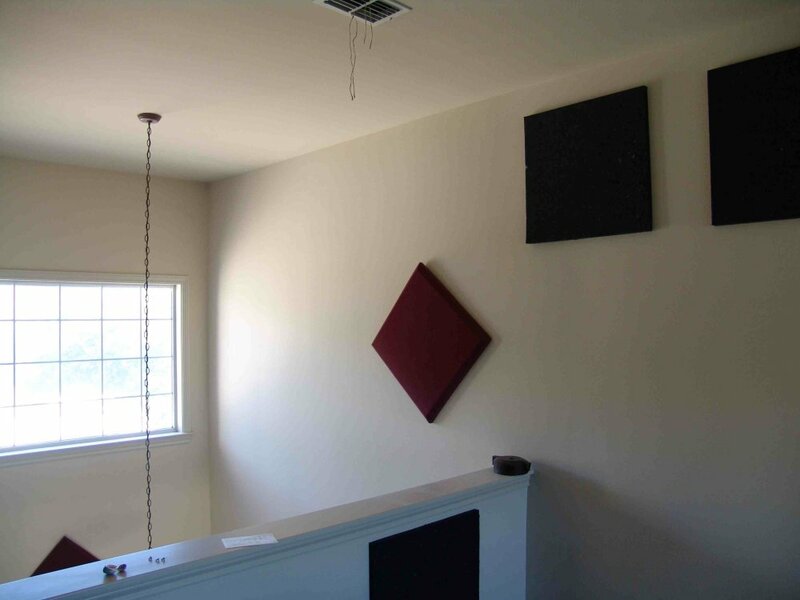 In building my home theater, I had purchased a B&W HTM2 and some speakers from an individual, Ed Frias, the EFE-22. I am using the B&W for the center and the EFE-22 for left and right. My back surround speakers are some older floor standing Polk (Monitor 10) speakers I had. The processor and amp are from Outlaw Audio and are the model 950 pre/pro and the 5 channel model 755. The sub is a Velodyne HGS-II 18". I wanted to compare the EFE's to the HTM and also to my main stereo. If the EFE's were good enough, I was considering replacing the HTM with one another EFE. This testing wasn't as easy as it sounds because my main system is a tri-amped system. The speakers consist of the Focal 5" mid (one of the "W" sandwich units) and the T-120 Tiox tweeter. The woofers are a pair of older speakerlab 12" units in a 8 cu foot enclosure. All three driver amps are 100W/ch. The crossover is a Behringer 3400. To begin the test, I decided to create a bi-amp'ed system using the EFE's or the HTM as the mid/tweeter and continue using the existing woofer. I used a variety of crossover frequencies from 60 to 200 hz for testing the EFE/HTM. The figures show the basic test conditions for the various tests. The first thing I did was to calibrate using white noise the reference levels. This was done using white noise and an SPL meter. I wanted as much as possible to match the woofer volume to the EFE and HTM. I also wanted to match the SPL levels between the various setups. The first precheck (no woofers) showed both units lacking as full range units. Of course, for the home theater, this is not so important as the HT has both an LFE channel, and also the outlaw has bass management to transfer low frequency energy from the 5 channels to the LFE channel. Definitely the more difficult analysis as I only have one HTM. For this test, I stacked the HTM on top of the EFE, switched to mono, and drove only one speaker at a time. The woofer was disabled for this test. I kept the xover in place to minimize LF and also so I could slide the frequency up so I could compare the HTM and EFE low frequency responses. While setting the gains so the two drivers were matched in amplitude, I noticed the EFE had a different tonal character, emphasizing that there seems to be a dip in the mid/tweeter crossover frequency range. I hadn't noticed this with the reference system as I used only the mid output to align the gains between the reference and EFE) The HTM for hiss, sounded better. The HTM is quite a bit more efficient too. About 5 db, although I'm not sure if part of this is in part because of a lower impedance in the HTM. Listening tests (difficult in mono) appeared to show a greater midrange presence in the HTM, almost excessive for rock/jazz. For classical voice and violin though, I preferred the timbre of the HTM over the EFE. Next, I tried adjusting the crossover frequency of the Behringer, to see how the two compared when I moved up the lowest frequencies the speakers needed to reproduce. The EFE had a better low end, showing a much more dramatic sound change as I increased the cutoff frequency. Both the HTM and EFE sounded excellent, but the timbre difference is troublesome, particularly because all 3 speakers will be in the front of the HT. Still not sure if the difference warrants purchasing another EFE and trying to sell the HTM.